These clients came to us with an existing solar system that they wanted to expand. We were able to utilize a lot of their existing system by doing series/parallel connections on their roof, saving them some money on parts and labor. They also requested a larger battery bank. Their existing battery bay wasn’t large enough to accommodate the four additional AGM batteries we installed, so we put half of them inside the existing bay, and the other half in their coach underneath their dining room bench. 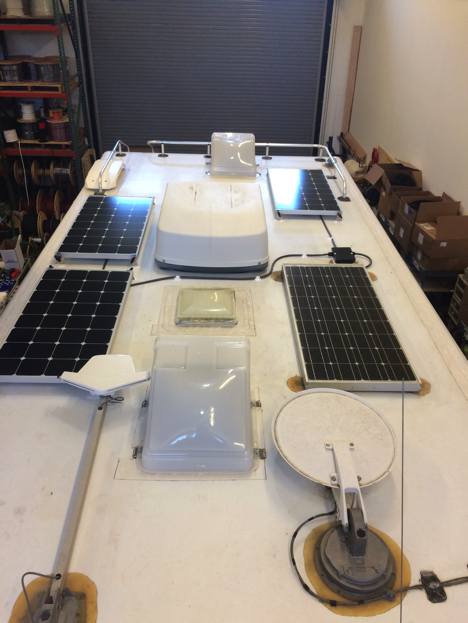 The additional 300W of solar power, and the added battery capacity will allow them to dry camp for a longer period of time.